​The Lanier Education Foundation awarded over $45,000 in grants at the Lanier Cluster Breakfast held on August 5th at Lanier High. 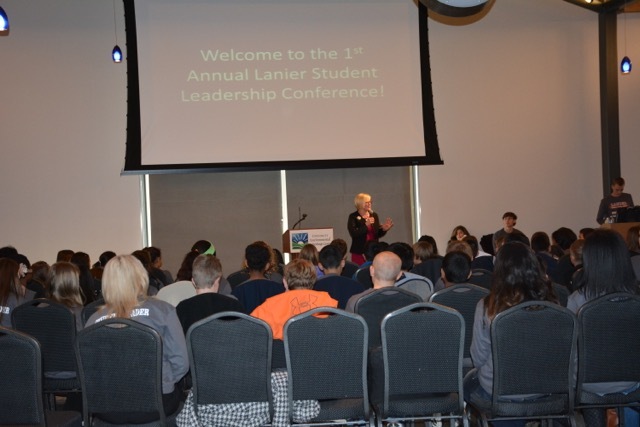 Approximately 460 teachers and administrators from Lanier High, Lanier Middle, Sugar Hill Elementary, Sycamore Elementary, and White Oak Elementary attended the annual event. The Foundation’s president, Amy Ballar, presented thirty-seven grants on behalf of the Foundation. The Lanier Cluster is becoming known for its innovation in teaching. 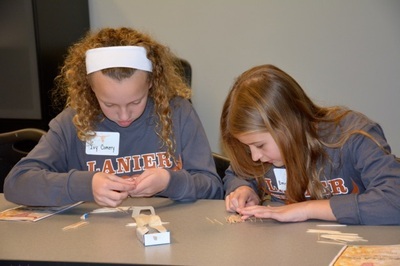 Last year, the Lanier Cluster received Gwinnett County's Innovation and Transformation Award. 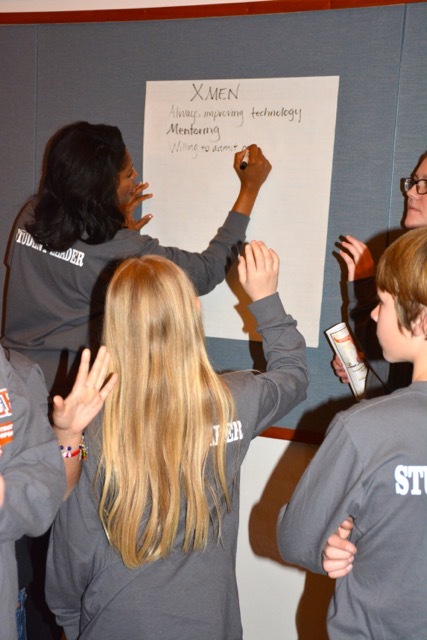 The majority of the grants awarded last week focus on endeavors related to Project Based Learning as well as the Cluster’s highly regarded STEM program. Three cluster-wide grants were presented to principals Dr. Taffeta Connery, Dr. Reuben Gresham, Mr. Todd Hamilton, Ms. Jean Loethen-Payne, and Ms. Crystal Thompson: the Lanier Leadership Conference, the Half Hour Heroes School Based Mentoring Program, and the Project Based Vertical Team. These grants are funded by profits from the Foundation’s two fundraisers during the 2015-16 school year, Tannery on the Green, held at the Sugar Hill Golf Club and the Hook‘em and Hold‘em Casino Night which was held at Tannery Row Ale House. The Foundation has given over $200,00 to the Cluster schools in the last five years in the form of grants and scholarships. Cluster principals named the current Foundation president Amy Ballar the recipient of the Lanier Community Spirit Award. Ballar has been with the Foundation since 2014. Lanier Education Foundation was presented with a video from the principals of Sugar Hill, Sycamore, White Oak, Lanier Middle, and Lanier High to recognize the Foundation's impact on our schools. It is only because of the support of loyal donors and sponsors that Lanier Education Foundation has been able to give over $155,000 in grants to our schools during the past four years. We encourage you to watch this short, heartwarming video featuring Lanier teachers, students, and principals and see how we work to support our schools as they continue to transform the way our children learn by embracing innovation, technology, and collaboration. The Lanier Education Foundation is excited to announce two all-new fundraising events being held in lieu of the Blue Jean Ball to support our schools. Mark your calendars for Saturday, November 14 for Tannery on the Green and plan to join us for a crisp evening under the stars at Sugar Hill Golf Club and sample craft beverages and food pairing stations provided by Tannery Row Ale House. Join us again on Saturday March 12 for Hook'em and Hold'em Casino Night at Tannery Row Ale House. Hook'em and Hold'em Casino Night tickets are available now. Faculty and Staff -- Support YOUR Schools on Thursday, September 10! The Lanier Education Foundation invites all faculty and staff at Lanier High, Lanier Middle, Sugar Hill Elementary, Sycamore Elementary, and White Oak Elementary to support the Foundation by purchasing a $15 pass (or $5 per day) to wear jeans to school on Thursday, September 10*, Wednesday, November 18, and Wednesday, March 23. The Lanier Education Foundation is offering a Blue Jean Grant to each school, and we will directly match your participation on Thursday, September 10*. Encourage your co-workers to join you in supporting the Foundation and your school! Please print this form and submit it with payment to your school office by Thursday, September 10 to claim your passes. *Due to Curriculum Night, Lanier Middle will participate on Friday, September 11. 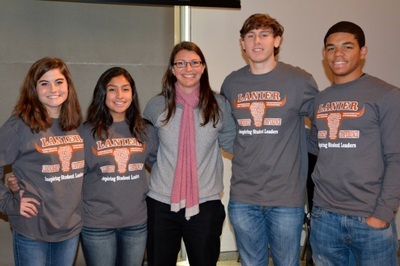 The Lanier Education Foundation awarded $56,000 in grants at the Lanier Cluster Breakfast this morning at Lanier High. Approximately 460 teachers and administrators from Lanier High, Lanier Middle, Sugar Hill Elementary, Sycamore Elementary, and White Oak Elementary attended the annual event. The Foundation’s newly appointed president, Amy Ballar, presented the grants on behalf of the Foundation. The majority of the grants focus on endeavors related to project based learning as well as the Cluster’s highly regarded STEM program. Three cluster-wide grants were presented to principals Ms. Chris Godfrey, Dr. Reuben Gresham, Mr. Todd Hamilton, Ms. Jean Loethen-Payne, and Ms. Crystal Thompson: the Lanier Leadership Conference, the Half Hour Heroes School Based Mentoring Program, and the Project Based Vertical Team. 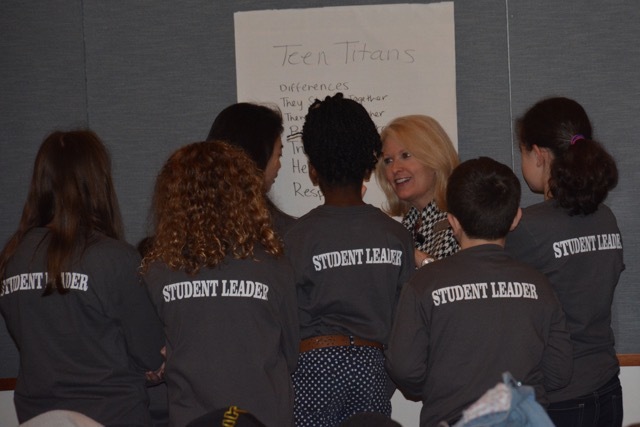 Grants are funded by profits from the Foundation’s primary fundraiser during the 2014-15 school year, the Blue Jean Ball, which was held on February 28, 2015, at Lake Lanier Islands Resort. The Foundation has given over $155,000 to the Cluster schools in the last four years in the form of grants and scholarships. 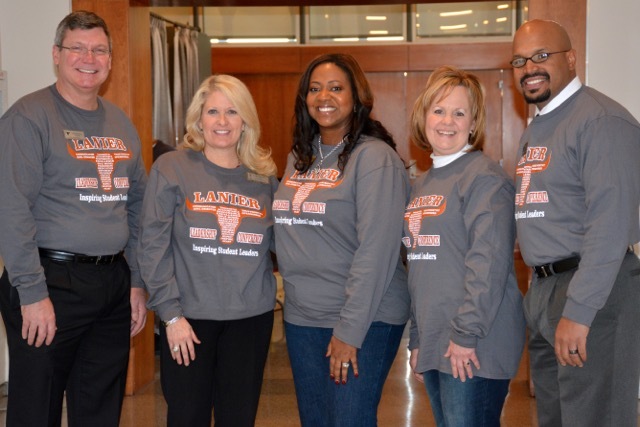 Cluster principals named former Foundation President and current Advisory Board Member D. Allen Smith the recipient of the Lanier Community Spirit Award. Smith has been with the Foundation since its inception in 2011. He served as a member of the inaugural Board of Trustees, he served as President from 2013-2014 and 2014-15, and he is currently serving on the Advisory Board with City of Sugar Hill Mayor Steve Edwards and former Foundation Vice President Stacey Warchol. The Lanier Education Foundation is accepting applications for available seats on 2015-16 Board of Trustees. We encourage you to submit your application by April 30 to your local school, via email to LEFPresident@gmail.com, or mail to Nominating Committee, Lanier Education Foundation, 918 Buford Highway, Sugar Hill, GA 30158. Five schools participated in a cluster-wide Blue Jean Day and the results were even more successful than the first Blue Jean Day. Teachers and staff at our schools were given the opportunity to purchase a pass for $5 to wear jeans in a show of support for the Lanier Education Foundation. Sugar Hill Elementary had the highest level of participation (85% of their staff bought passes ) and Sugar Hill teacher Allison Callahan, won a ticket to the Blue Jean Ball! Thanks to everyone who participated. Mr. Randy Crutchfield, Multimedia Communications and Fine Arts Academy Language Arts teacher at Lanier High, has been working hard to give the community a fine arts festival. Because this event has been sponsored exclusively by the Lanier Education Foundation, the festival is completely free. The Lanier Cluster Fine Arts Festival takes place on Saturday, January 17, from 12:30PM-5PM at Lanier High School. 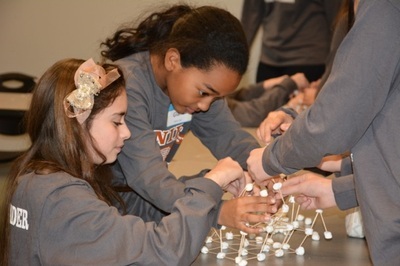 As a Lanier Education Foundation grant recipient, Crutchfield and his students were able to plan the event featuring children from Cluster schools as well as members of the community. In addition to music performances by Lanier High Orchestra, Band and Chorus, festival patrons will experience student art, face painting, storytelling, and concessions. In honor of Martin Luther King, Jr., holiday, Crutchfield has arranged for author Jamilah Tetterton to read from his book, From Where Do We Come? Crutchfield is grateful for the Foundation’s support. 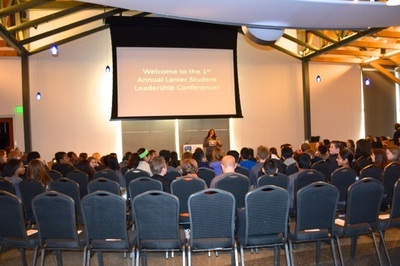 One hundred and forty students from Sugar Hill, Sycamore, White Oak, Lanier Middle, and Lanier High were selected to participate in the inaugural Lanier Leadership Conference on January 9, 2015, at the Gwinnett Environmental and Heritage Center. The Lanier Education Foundation was honored to be selected as one of the four sponsors. Students participated in leadership training, team-building exercises, and a STEM project. Guest speakers included Mr. Clay Hunter from Gwinnett County Public Schools, Chief Magistrate Judge Christina Blum, and Mrs. Erin Beacham from the Anti-Defamation League. 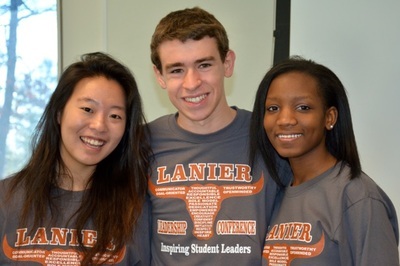 Principals, Counselors, and Lanier High Peer Leaders made this an exceptional experience for future leaders. 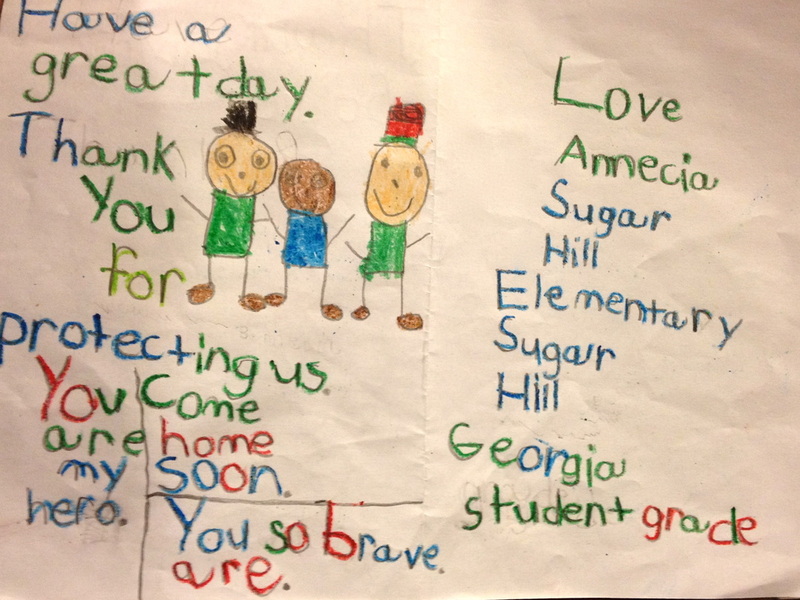 Students attending the six schools supported by the Lanier Education Foundation wrote 3,085 letters for the Bert Show’s 2014 Big Thank You campaign. 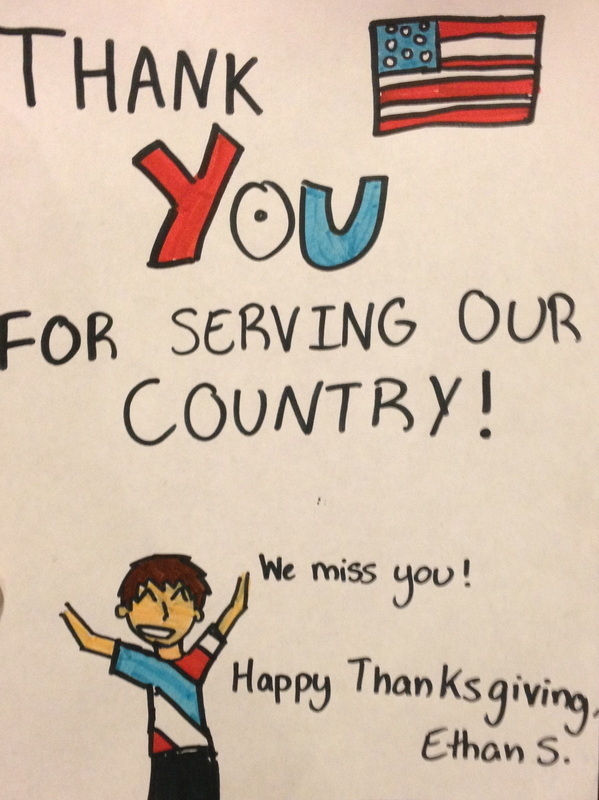 This program provides a handwritten letter of gratitude to each service member stationed outside of the United States on Thanksgiving Day. 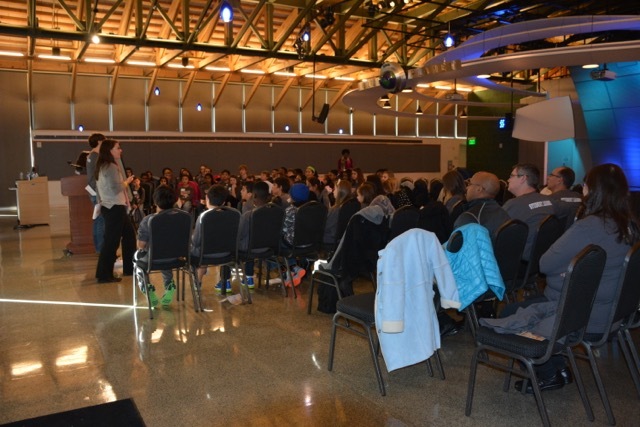 The Foundation encouraged students from the six schools it supports, the T. Carl Buice School, Sugar Hill Elementary, Sycamore Elementary, White Oak Elementary, Lanier Middle, and Lanier High to participate in this initiative. 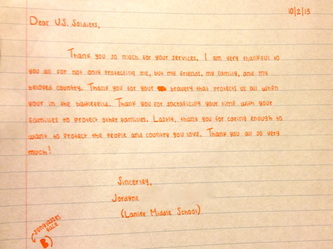 Students from Lanier High wrote 1,385 of the letters. “This is the third year our schools have taken part in the Big Thank You project, and while we’ve always had great participation, the response from our students this year was overwhelming,” said Allen Smith, Foundation President. “Due to the contribution from the students at Lanier High coupled with the heartfelt efforts of our five other schools, we were able to submit over thirty percent more letters this year. Our Executive Board read well over half of the letters, and the innocence and the sincerity of what the children write never ceases to amaze me. I take great pride in being part of an organization that prioritizes the importance of showing gratitude, particularly during the holiday season,” said Smith. Our first cluster wide Blue Jean Day was a success. Teachers and staff at our six schools had the opportunity to purchase a jeans pass to show their support for the Foundation. 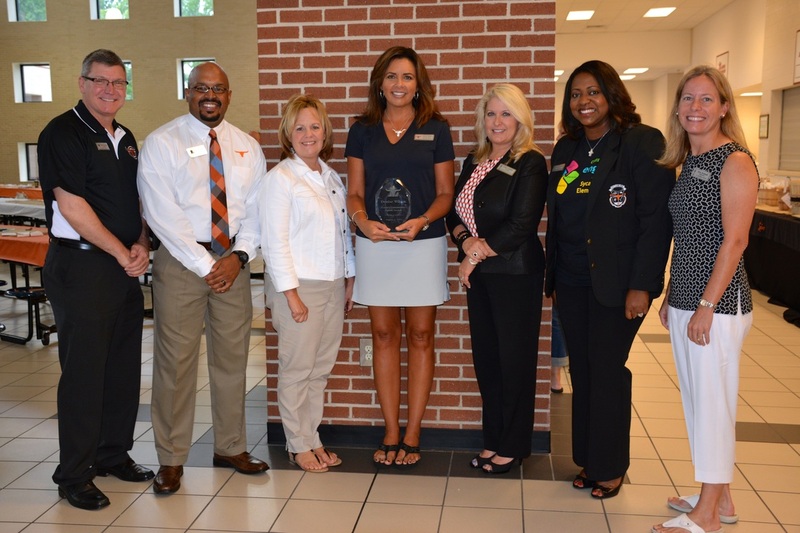 Lanier Education Foundation Board Member Denise Wilcox was presented with the Lanier Cluster’s Community Spirit Award at the Lanier Cluster Breakfast on August 1, 2014. Sugar Hill Elementary principal Chris Godfrey presented the award, which recognizes dedication to the success of the Cluster as a whole. Past recipients include Stacey Warchol and Lisa Ramsay. 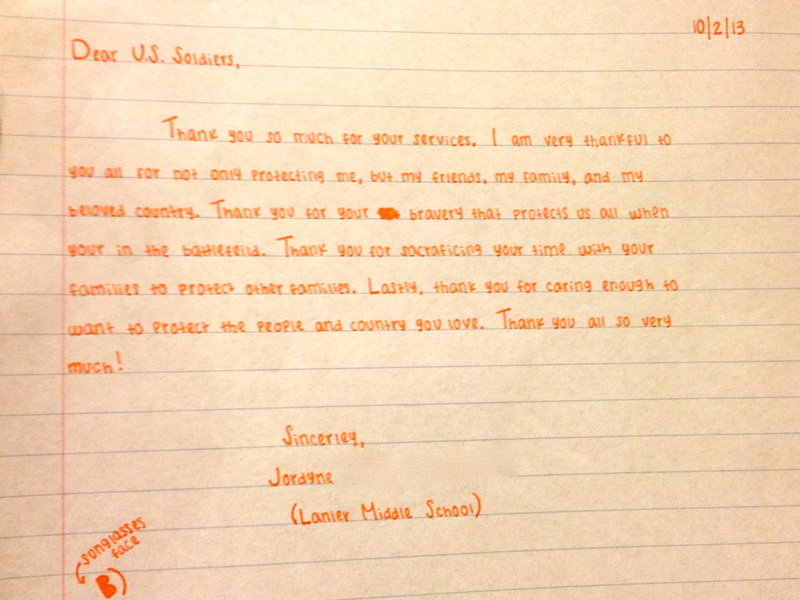 The Lanier Education Foundation proudly submitted 2,100 letters written by students from local schools to The Big Thank You campaign in November of 2013. 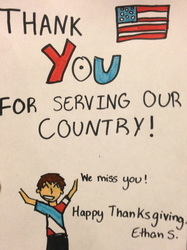 The Big Thank You, sponsored by a local radio station, will deliver a handwritten letter of gratitude to each service member stationed outside of the United States on Thanksgiving Day. The Foundation invited students from the six schools in the Lanier Cluster, the Buice School, Sugar Hill Elementary School, Sycamore Elementary School, White Oak Elementary School, Lanier Middle School, and Lanier High School to join in this initiative. "I have been fortunate enough to participate in The Big Thank You for two of the last three years," said D. Allen Smith, Foundation President. "Since one of my goals for the Foundation is to take a more active role in our community, it was very rewarding to see our children provide such meaningful support to the people serving our country. This year, I was able to personally read close to 800 of the 2,100 letters written by the teachers and students in the Lanier Cluster schools. I am sincerely amazed by the colorful pictures, the thoughtful comments and the overall commitment to creating these heartfelt masterpieces," said Smith. Congratulations to Dr. Carrie Doker, a fourth grade teacher at Sugar Hill Elementary, and Ms. Joan McElroy, a literacy coach at Lanier Middle. Both women were named Teachers of the Year at their respective schools and then earned the honor of being named among the Top 26 Teachers in Gwinnett County. BUFORD — As Nick Lima worked with a software program to replicate a plant cell so that it could materialize out of a 3D printer, he thought about his classroom alternative.“This is way better than sitting down and writing notes in a textbook,” said Lima, a fifth-grader at White Oak Elementary. 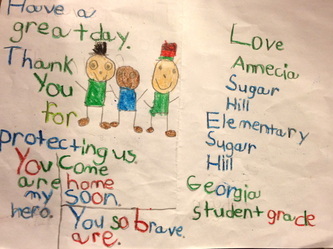 Lima is one of hundreds of students in the Lanier cluster who have a similar sentiment. A classmate of Lima’s, Will Shaw, was in a room next door also exploring a plant cell in a program that resembled a video game. “It’s easier to wrap my head around the content when I’m allowed to have fun at the same time,” Shaw said. That attitude is why this custom project-based learning model, which started four years ago at Lanier High, and moved to White Oak last year, is a success, teachers said. Teacher Mike Riley of Lanier’s Center for Design and Technology said the idea came to him when he was a teacher at North Gwinnett High and thought about merging robotics and video game programming. “The big thing is we wanted to push something the kids are interested in, and they’re pretty much working their butts off now, which is great,” Riley said. As the program at Lanier has grown, it now fills an entire floor at the school, and has plenty of equipment to let students’ creativity roam. Lanier earned a $40,000 grant from Motorola Solutions, and has more than 20 cameras, video and still, boom and wireless microphones and an $8,000 sound booth. 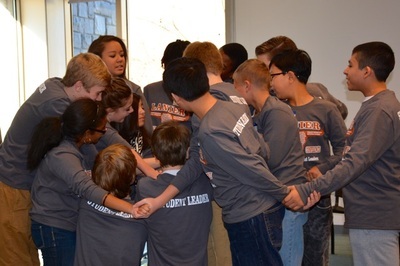 The ideas have spread to other schools in the Lanier cluster, like White Oak, and Lanier Middle, which calls its program TWIST, or Teamwork With Innovative Skills and Technology. For White Oak fourth- and fifth-graders, teachers Nick Boyers and Matt Smith said they teach a six-week set of curriculum in three weeks, which gives their students the remaining three weeks to work on a project. During a recent lesson, White Oak fourth graders conducted a video conference with a vice chief of a Seminole tribe in Oklahoma. “It was a cool experience,” Boyers said. “They found a lot of information you can’t find in textbooks, you can’t find on the Internet. He was able to give them real deep information.” Another group last year held a video conference with a doctoral student at Georgia Tech who focused his dissertation on the effects of cloud cover on solar energy. That coincided with a unit on weather, Boyers said. At Lanier, one lesson asked the students to tie an aspect of science into the classic poem The Odyssey, and then demonstrate it using a form of technology. “If they’re making a video game about The Odyssey, or a movie about The Odyssey, they’re more likely to remember the information because they have to digest it in order to demonstrate it,” Riley said. It’s also paying off where it counts most with administrators: test scores. Riley said nearly 100 percent of his students passed the language arts test, while more than 50 percent exceeded expectations. The junior class alone stood out because about 70 percent exceeded expectations. 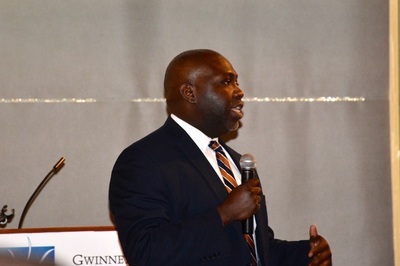 Riley said this learning model is not only unique to Gwinnett County Public Schools, it’s also in a class by itself across the country. And parents have become impressed because the program has incorporated input from the business community and technology experts around the country. Part of that relationship comes in the form of internships where seniors work with business professionals. That’s the culmination of a process where freshmen learn several music and video software programs, then become specialists as sophomores and create products for sale as juniors. Lanier sophomore Connor Henderson said he enjoys CDAT because he’s a project person. “I feel like I get more of a hands-on feel, and implement it and make real world stuff,” he said. The Lanier Education Foundation's Board of Trustees member Stacey Warchol was presented with the second annual Lanier Community Spirit Award during the Cluster breakfast in August of 2013.